Here's some pretty inspiration for your Wednesday! I tend to lean toward neutrals and a very classic/traditional look when it comes to decorating my home, but lately I am loving these bold walls! 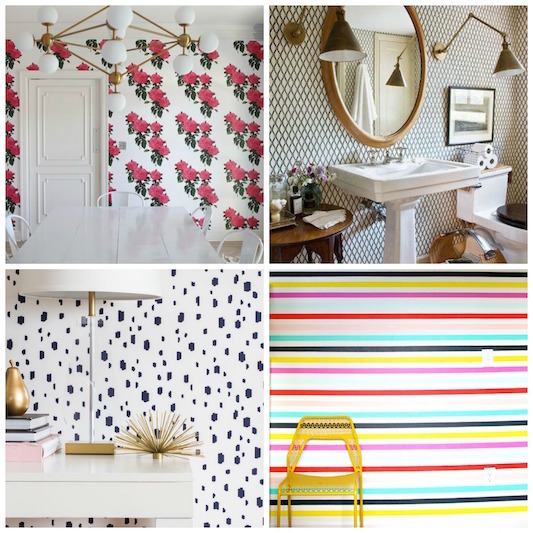 I don't think I could wallpaper a main living space in my house, but maybe the powder room or a smaller space? I do love those painted stripes--would be fun for a kids' room, don't you think? I like the splotchy polka dots! You should definitely do something like this in your powder room! Or maybe a wall in the play room? ?